Aditi Nafde, University of Newcastle, and Elon Lang, The University of Texas at Austin, have organized a session for the 2016 NCS and we owe them a huge ‘thank you’ for their enthusiasm and hard work. The session is included in the Chaucerian Networks thread, and will run on Tuesday, 12th July, from 4:00-5:30 pm in PP2. This roundtable seeks papers that address the influence and afterlife of manuscripts and text-makers that contributed to the continuity and development of England’s literary culture both during and after Chaucer’s life. We invite proposals that consider the networks of poets, scribes, books, and other cultural influences that led to Hoccleve’s famous identification of Chaucer as his poetic “fadir” and as the “firste fyndere of our fair langage”. What textual and cultural networks may have supported Chaucer’s early canonization and contributed to the broader fabric of late medieval literature? How might Chaucer’s as well as Hoccleve’s and others’ influence help us reposition the centre of late medieval literary and material culture? If so, how might other texts and authors be reconsidered in relation to Chaucer? Papers might focus on codicological, palaeographical, and book historical work on books produced before and after Chaucer, on manuscripts that might have influenced Chaucer’s manuscripts, and on Chaucer’s works produced posthumously. Likewise, papers might examine readings that can be traced through Chaucer, both back to his influences and forward to Hoccleve and his other inheritors. Please consider joining the session for what promises to be a wonderful discussion of pre- and post- Chaucerian textual, intellectual, and cultural networks. On 30 September 2015, IHS conducted its annual general meeting to discuss Society business and plan for the coming year. The meeting was a teleconference conducted via Skype, and the minutes are available here in PDF format. 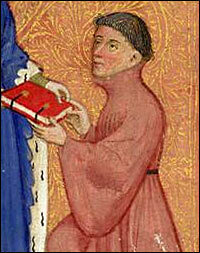 Although Hoccleve traces his recovery from mental illness to a spiritual intervention on All Hallows, his social recovery required the society of his peers. Hoccleve encoded this recovery into his Series, depicting a conversation with a friend about his stability and desire to continue writing. Similarly, a conversation with an old man dominated the prologue to the Regiment of Princes, in which Hoccleve sought career and life advice from a wise and caring passer-by. His contacts and connections were remedy as well as motivation to overcome his ills. Much critical work on Hoccleve centers on the emotions he portrays, and how his life was touched by the poverty, precarity, and anonymity of late medieval England. Hoccleve imagined a recovery jointly financial, psychic, and physical, one that required an unraveling of his social disaffection. Join us on 1 November 2015 in celebrating Hoccleve’s recovery of his London community by participating in this social media event, in which we touch on Hoccleve’s struggle with mental health by exploring the ways our lives touch each other within networks of wellness and support. We invite you to post passages or images related to Hoccleve or his medieval peers, perhaps favorite lines from his poetry, a testimonial on why these verses should be remembered, or encouragement to Hoccleve and to each other in our daily efforts at the Privy Seal or in the academy. Please identify your posts and tweets with the hashtag #Hoccleve, and feel free to “like” or retweet thematically pertinent items throughout the day under this hashtag. You may also attach other tags (#memory, #medievalistproblems, #emotion, #MSilluminations, etc.) after #Hoccleve as they are relevant. We will kick off the event with posts on our Twitter feed, Facebook account, and Tumblr page. So please follow us there and on this site! Recent work in such fields as disability studies, book history, affect studies, the history of emotions, and cultural studies has raised provocative questions about the writings of Thomas Hoccleve, the fifteenth-century Privy Seal clerk and friend of Geoffrey Chaucer. Hoccleve’s autobiographical accounts of his struggles with mental illness, social disaffection, and the physical strain of writing have offered modern scholars fruitful sites for re-examining the body, its textual representations, and its affects in ways analogous to current work in these emergent interdisciplinary fields. In particular, Hoccleve’s texts permit critiques of the presupposition of normative, able bodies as well as explorations of the variety of non-rational, sub-discursive ways that bodies affect and are affected by their surroundings. Recent scholarly attention to both the discursive affects and material effects of Thomas Hoccleve’s poetry has offered numerous sites for touching the medieval to these modern interventions. Our panel seeks papers that extend work along these critical interventions, organizing our thought around the metaphors of “touching” and “recovering.” Thomas Hoccleve’s affective and emotional economies stage the categories of wellness, malady, (dis)ability, precarity, and recovery in quixotic and often thought-provoking ways. The blurring languages of financial, mental, and physical recovery in Hoccleve’s poetics present a complex interaction between the physical and psychic burdens of a precarious life. We hope the panel will consider both the ways Hoccleve’s depictions of malady and recovery can be touching and the sites where modern critical methods can touch Hoccleve’s medieval world in ways similar to those proposed by affect theorists like Erin Manning and medieval literary scholars like Carolyn Dinshaw. We invite papers that touch upon Hocclevean recovery in all of its facets and forms, including his poetic descriptions of recovery and its attendant affects, the recovery of Hocclevean material, the medieval medical contexts of Hoccleve’s infirmities, the work of memory as an act of recovery in the past and the present, the place of the text in all of its materiality as a document of recovery, and the blurring of financial, psychic, and physical recovery. In other words, we ask what is touching about Hoccleve’s poetry – what does it mean to be touched by it, to touch on it, or to handle its material? We hope to offer a more nuanced and sensitive account of the affects, emotions, bodies, and texts engendered by Hoccleve’s poetics of recovering while also remaining open to the ways that recovery and the poetics of touch can be risky (or risqué). We recognize that touching the past can be dangerous or have the potential to diminish or destroy the very material we seek to handle. Similarly, we are sensitive to the ways in which thinking, writing, and speaking about recovery and non-normative bodies or subject positions can be difficult, uncomfortable, potentially offensive, or otherwise disaffecting. To touch the past can be exposing. Yet, the past’s provocative power resides in its very exposures to us and its power to expose us in its brief brushes and gentle caresses. We take up Hocclevean recovery, then, in order to ask whether, how, and why it touches us and how we might continue to reach back a recovering hand to our Hocclevean texts. Please submit abstracts and inquiries to The International Hoccleve Society at hocclevesociety@gmail.com by September 15. The Newsletter of the International Hoccleve Society, Volume 2 (Spring, 2015), is available. In the annual newsletter, you will find updates about IHS projects, a bibliography of publications and dissertations in Hoccleve studies, and summaries of important Hoccleve-related events and conference sessions. In his “Complaint,” Thomas Hoccleve claims that his memory returned to him on Alle Hallowmesse. In order to mark the occasion, the International Hoccleve Society invites you to join us in “Remembering Hoccleve” on 1 November 2014. We invite you to participate by posting short medieval passages and/or images on the following topics on Facebook, Twitter, and Tumblr: healing, the benefits of being among people, complaints about money, complaints about one’s perception in the world, images that show medieval medical practice, images related to Alle Hallowmesse and the autumn saints days, etc. Alternatively, you can participate by “remembering Hoccleve” in some other way, perhaps by sending or posting a favourite passage from his work (up to 14 lines) and a short explanation of why you think it should be remembered. Please identify your posts and tweets with the hashtag #Hoccleve. Image courtesy of luminarium.org. Detail from British Library MS Arundel 38 f. 37. We will kick off the event with posts on our Twitter feed, Facebook account, and Tumblr page. So please follow us there and on our webpage! We hope you will join us by posting at least one item on 1 November under the hashtag #Hoccleve and liking or retweeting thematically pertinent items throughout the day under this hashtag. Please, of course, feel free to attach other hashtags (#memory, #medievalistproblems, #emotion, #MSilluminations, etc.) after #Hoccleve as they are relevant. The International Hoccleve Society seeks to promote scholarly attention to the writings of Thomas Hoccleve, especially by providing a forum for reappraisals of and innovative approaches to his work. This year’s session turns its attention to the less-studied parts of Hoccleve’s oeuvre. The Society seeks to encourage scholars to challenge conventional notions of Hocclevian canonicity. In this session, we will work to destratify Hoccleve scholarship and create a polysystematic set of readings of Hoccleve’s lesser known works. In doing so we welcome presenters to use the “major texts” as points of departure while working to expand the boundaries of Hoccleve studies. In our endeavor to disrupt the problematic differentia specifica of Hoccleve’s work at our Kalamazoo session, we seek to build upon the work of scholars who have begun this effort. For example, thoughtful criticism by Robyn Malo, Ethan Knapp, and Heather Hill-Vasquez, has persuasively demonstrated how Hoccleve’s ‘minor’ works, the “Letter to Cupid,” the “Address to Sir John Oldcastle” and the Marian Lyrics, are informed by many of the same literary traditions or discourses with which he engages in The Regiment of Princes. Others, such as Linne Mooney, Helen Hickey, and Ruth Nisse, have moved beyond the canonical understanding of Hoccleve as an autobiographical poet and thereby opened up all of his work to new interpretive frames of reference. The premise for this session is to continue conversations started by such scholars. We seek papers that make an effort to de-familiarize Hoccleve studies by emphasizing Hoccleve’s texts that are not normally considered to have much weight in Hoccleve scholarship, and to explore the gravitational pull they might have to Medieval Studies and Fifteenth Century Studies as a whole. In particular, by looking beyond The Regiment of Princes, this session proposes a more robust and heterogeneous perspective on the Hocclevian literary corpus. We propose that participants consider not only under-represented texts, but also resonances within the texts themselves to each other and to both modern and medieval generic and scholarly discourses. Questions to consider might include: how might Hoccleve’s (over)use of the penitential genre affect its power to console? How might the Formulary expose genre indeterminacies by disseminating seemingly contradictory forms—the bureaucratic and the artistic—in the context of fifteenth-century poetry that exposes a fundamental instability of both genres? How might Hoccleve’s translations both undermine and reinforce ideas of masculine literary identity? By engaging in this carnivalesque celebration of textual expansion, we hope to turn Hoccleve’s lesser known works into their own competitive cooperation of divergent voices within this writer’s full literary corpus. We especially welcome paper proposals that consider Hoccleve’s lesser known works in the context of theory, manuscript dissemination, textual history and/or media studies, modes of social engagement, and connections between themes, literary devices, language, and prosody. Please send 250-word proposals to hocclevesociety@gmail.com by September 15, 2014.